Can a resort block your timeshare sale? When you buy a timeshare, you usually know that you’ll want to sell it sometime in the future. It’s the same as when you buy a home. Circumstances change as we move through life, and chances are that you’ll want to sell that house someday. The kicker is this. What if you find a buyer, then the timeshare resort won’t allow your sale? Can they keep you stuck with it forever, paying those maintenance fees? This is the issue in a recent lawsuit that’s been filed against the Christie Lodge in Colorado. Linda Space owned a timeshare at this resort. She no longer used her timeshare, and wanted to sell it. The best bid she got on eBay was $1, so she sold it for that price. The Association refused to acknowledge the sale. The Association stated that they would continue to bill Ms. Space for maintenance costs and for owner assessments. The Association would also not acknowledge the ownership, and not convey the benefits of ownership, to the buyer of the property found by Ms. Space. Can they do this? When you own a timeshare, it should be your right to sell it (even if the best price you can get for it is $1)! The Association based this denial upon the assumption that the proposed buyer of the unit would not be personally using the unit, only renting it to others. This was despite the fact that Ms. Space and many other timeshare owners had not personally used their units in years and there is no declaration that prevents a timeshare owner from renting timeshare weeks. That doesn’t make much sense to me. They’re basing it on an assumption, not a fact? And how can they block it because of “assumed plans to rent” if there’s no rule against renting? It turns out they can block pretty much anything they want to block, just by saying it’s “suspect”. The Association can, under Rule K, label as suspect any transfer it simply believes as suspect. This allows the Association to define suspect on its own and apply its power in a capricious manner. Yikes! That’s a pretty scary rule, especially when they start using it block people’s legitimate sales on eBay. I would NEVER want to own a timeshare at a resort that tries to lock me in and prevent me from selling like this. Mountain timeshares are great for skiers – unless they won’t let you sell! I’m not a big fan of lawsuits, but this one seems like it had to happen. If you’re in this owner’s shoes, how are you supposed to get rid of your timeshare when the resort blocks your sale? The owner is suing the resort association over the issue. I sincerely hope that the timeshare owner wins this one. If resorts are allowed to make and enforce vague, sweeping rules like this, that hinder our ability to sell something we own, that’s not a good thing for timeshare owners. I don’t want to be locked into perpetual fees at the whim of the HOA. 1) Don’t buy a timeshare at Christie Lodge. Until this case is settled, I wouldn’t touch this place with a 10-foot pole. I’d be worried that I wouldn’t be able to sell it again in the future. They could try the same tactic on me, blocking any sale and keeping me on the hook for on-going fees indefinitely. That’s not a situation I want to get into. If you’re thinking of buying, wait until the case is closed and you know the outcome. 2) Impact beyond this resort? I have no idea how many other timeshare HOA’s have similar rules that allow them to refuse “suspect” sale transactions. However, the outcome of this case will set a precedent that could be applicable to any other such resorts. Do you know the rules for your timeshare resort? 3) What happens to deeded property? I’m no lawyer, but this seems like a pretty grey area to me. If I sell a deeded property and properly record the deed in the name of the new owner, then they legally own it, regardless of what the HOA says. Does the HOA have the right to just ignore this, refuse usage rights to the new owner, and keep billing me instead? It sounds pretty shaky to me. Timeshare owners have rights, too! Have you heard of other cases where a resort tried to (or did) block the sale of a timeshare? Any comments on the case? I’d love to hear from you! Timeshares can make for great vacations, and it’s possible to get some terrific travel deals this way. The thing is that you need to know what you’re doing, or you could wind up paying thousands of dollars too much, or end up in a bad situation. 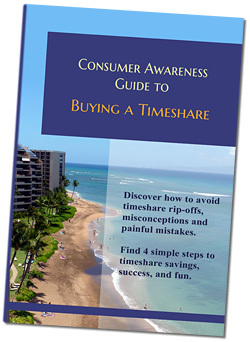 Check out this free Consumer Guide to Buying a Timeshare, for crucial information on common timeshare mistakes and scams, and how to avoid them. Make sure you know the facts before you spend a penny! Do timeshare owners get ripped off on cruises? I love reading about the bad boys finally getting what they deserve. I just wish they would all be shot down before anyone else gets hurt by them. Do thease company’s require any licencing before they even open the” scam stores, “? I would think that would prevent and filter out the people who have bad ideas to come to life. Why does the goverment wait until so many people get hurt first.? The old saying of an ounce of prevaintion can save a pound of cure. Hope you find a buyer! A few places you could try listing it are Redweek, EBay, and TUG (Timeshare User’s Group).